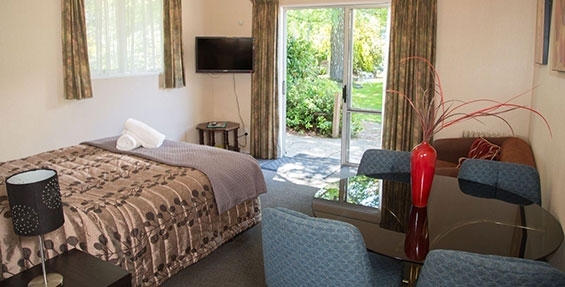 Central location, directly opposite Hanmer Springs Thermal Pools. Surrounded by our beautifully maintained gardens. 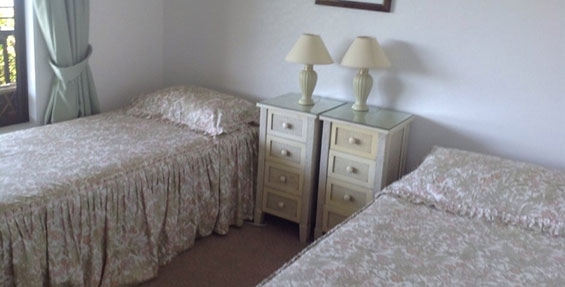 Centrally located motel in the village – just a stroll to everywhere! 26 rooms, some studios, some chalets, 2 x 1-bedroom Family Units. 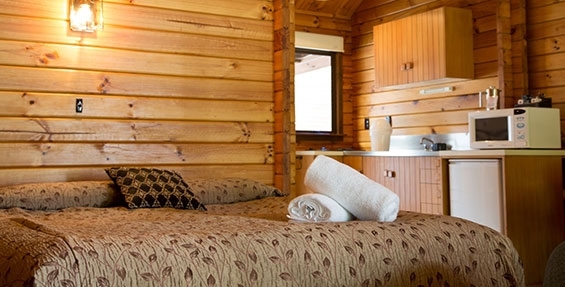 The Cottage, which has 2 bedrooms and a big lounge, is also great for families. 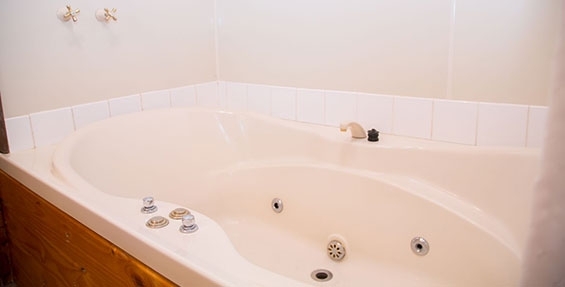 4 Tower Suites with an 8 foot ROUND bed and 2-person spa bath, 1 x 2 to 3-bedroom Apartment with ensuite, dishwasher and spa bath. 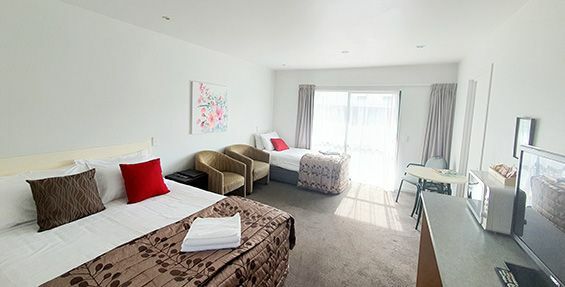 Sunny Studio Units, ideal for an overnight stay. 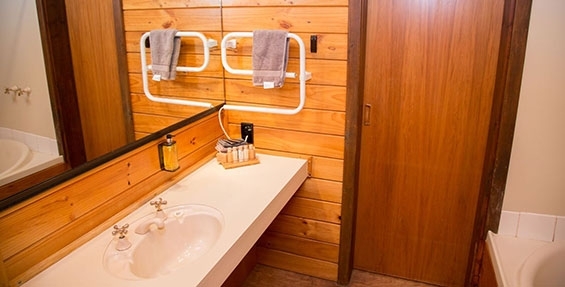 Cosy Chalet Units with framed pine wood interior, kitchen, ensuite and covered parking. Unique Tower Suites with a super king-size ROUND bed, a double spa bath, LCD TV and DVD player, kitchen. 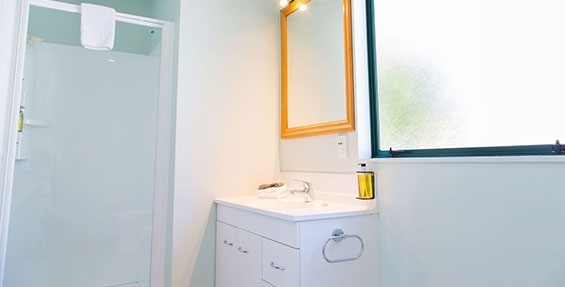 Apartment which can be 2 or 3 bedrooms, has a full kitchen, dining room, big lounge, sunroom, laundry, main room has ensuite. Great for the family or a couple of families. Has own yard and own parking, a home away from home. 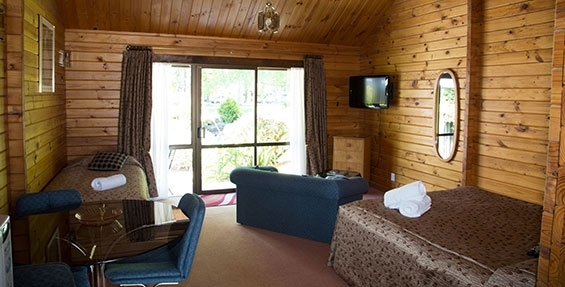 All rooms have a TV, 5 SKY channels and a DVD player is available on request. Free WiFi. Only 1.5 hours to Christchurch Airport! We can easily accommodate large or small group bookings and offer a discounted group rate. 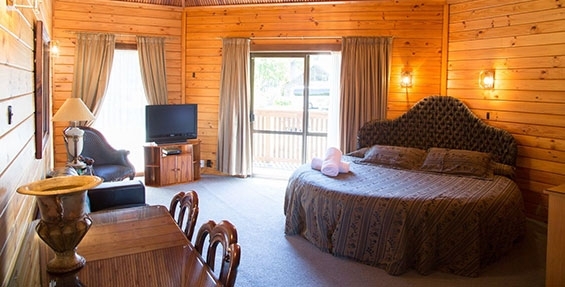 The pine wood framed interior and our unique super king-size ROUND bed and double spa bath are features that make our suites very popular for that special occasion, or if you just feel like treating yourself! Upstairs suites have a private balcony overlooking the surrounding village and all suites have garden and mountain views. 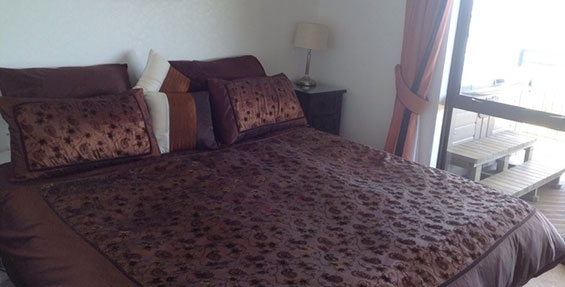 The suites also have a kitchen, LCD TV, DVD player, antique furniture and let's not forget – a ROUND bed! 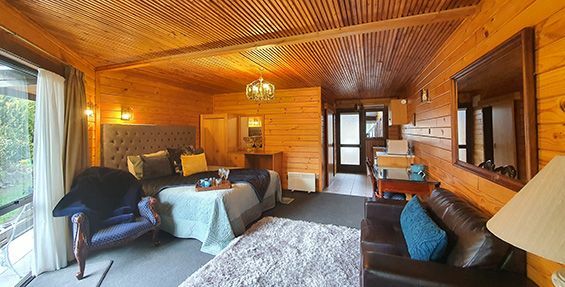 Chalets are our most popular accommodation, built in the traditional full timber Fraemohs design with fresh pine interiors, cathedral ceilings and sliding glass doors opening out to our gardens. 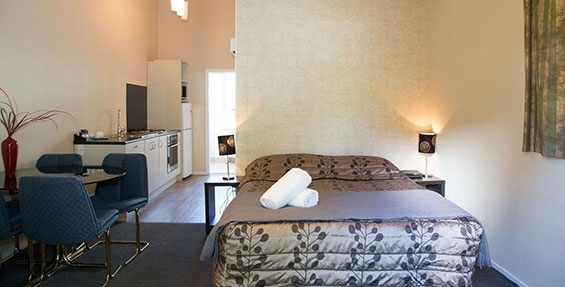 A single studio-style room with a queen-size bed (some also have a single bed), sofa, table and chairs, heating, TV, ensuite and kitchenette. Car parking is under cover and PRIVATE from the road. Outside is a 2-person bench to sit and relax whilst admiring our gardens and mountain views. A conventionally styled room where the lounge and bedroom are combined. 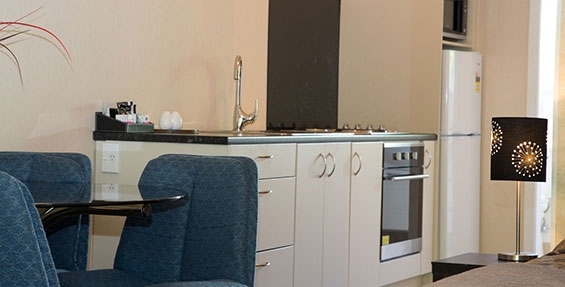 Studios include a queen-size bed and most have a single bed (1 studio has 3 single beds), ensuite, TV, heating and electric blankets for those chilly nights. Studios also have a refrigerator, tea/coffee-making facilities, toaster and a breakfast table and chairs. 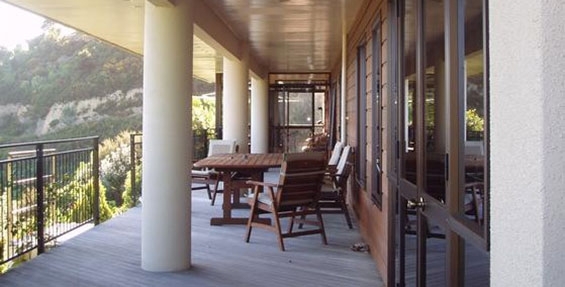 Why not sit on the veranda outside your unit to soak up the sun and enjoy the fresh mountain air! 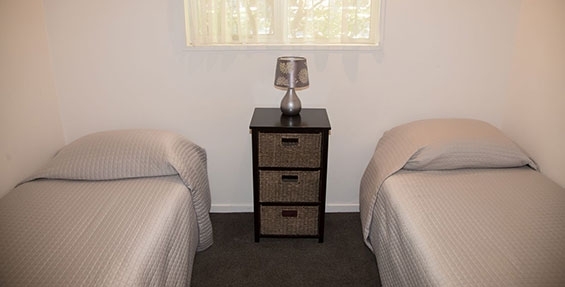 This room is perfect for a family, with a queen-size bed in the lounge and twin beds in a separate room. It has full cooking facilities including an oven. Relax and read a book in the garden just outside the unit or watch the kids run around after a soak in the hot pools just across the road. Minimum 3 persons. 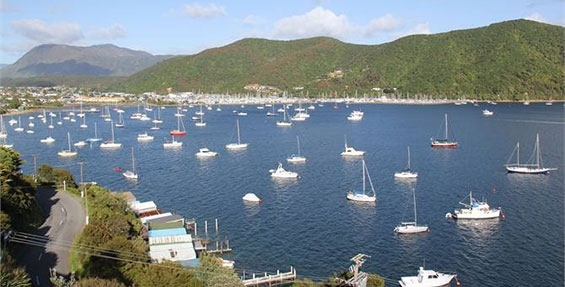 Heading to Picton? 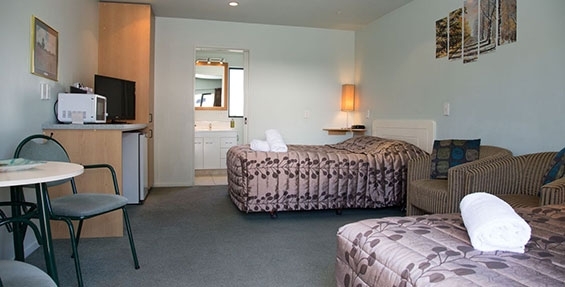 Stay in luxury at Waikawa Bay, Picton, looking out over the world-famous Queen Charlotte Sounds. Sit on the deck or in your private spa pool with a glass of wine and watch all the ships and boats pass by. Spectacular water views from all rooms, large covered deck with spa/BBQ. Private tranquil bush setting with no traffic. 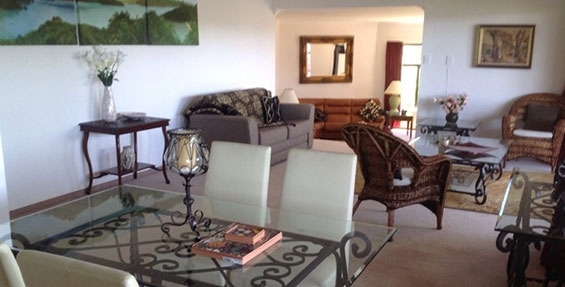 3 mins to the beach, playground, boat launching and restaurants. 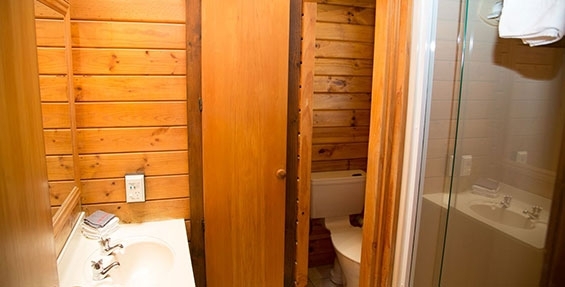 2 bedrooms with 2 beds, 1 bathroom, kids ok, no pets and no smoking.